Shihan Keiko Fukuda, 10th Dan, was one of the most important masters in the art of judo. 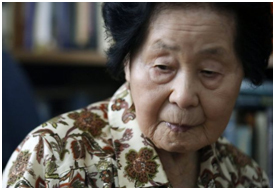 Fukuda Shihan has dedicated her whole life to Judo, for over 77 years, from her first years in the Women’s Section of the Kodokan, invited to study there by Jigoro Kano, founder of Judo, in the 1930s, till the present day. Her grandfather, Hachinosuke Fukuda was the first of the three Ju-Jitsu masters who taught Kano Shihan. Kano Shihan sent her out into the world to spread the teaching, tenets, and philosophy of Kodokan Judo. Only three other people in the world, all men living in Japan, have ever reached that mark. Coming from the very history of Judo, born in 1913 in Japan, sensei Fukuda was the last living student of Jigoro Kano. The connection between them was intermediated by her grandfather and this relationship materialized through his lifetime belief in Sensei Fukuda to accomplish that mission. In 1964 sensei Fukuda performed one of the most impressive Kata demonstrations, on the occasion of the Opening Ceremony of the Tokyo Olympic Games, when judo was first launched on the Olympic orbit. Her humanist vision on judo derivers from studying Japanese literature at the Showa University and also some traditional Japanese arts as Sho Do- calligraphy, Cha Do- the tea ceremony and Ikebana flower arrangements. Later, after she moved in 1972 to the United States, in 1974, sensei organized the first judo training camp dedicated exclusively to women. This event has become traditional under the name of Keiko Fukuda Joshi Judo Camp. She was also the initiator of the Keiko Fukuda International Kata Championship, in 1998. In 1990, as a recognition of her high merits in the progress of Kodokan Joshi Judo, sensei Fukuda was presented by the Japanese Government with the "Order of the Sacred Treasure". Further to all these impressive biographic moments, among the spiritual heritage left by sensei Fukuda are two of the most profound introspections in the world of judo, namely two books that she wrote:"Born for the mat" (1973) and "Ju no Kata"(2004). She gave up marriage and left her homeland to dedicate her life to judo, fighting gender discrimination that kept her at lower belt levels decades longer than men less skilled than she. PAWMA honored Fukuda Shihan with its Lifetime Achievement Award in 1997. Then, in 2011 Fukuda Shihan was granted 10th dan in Judo by USA Judo and US Judo Federation, the first woman ever to be honored in this way and the last surviving student of the founder of Judo. "The time was right," said U.S. Judo Federation promotion board member Eiko Saito Shepherd. 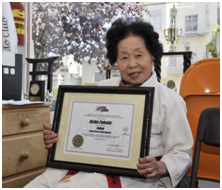 Fukuda Shihan taught classes, including one consisting of all women, three days a week at Joshi Judo Club in San Francisco up until her recent illness. We and the world of Judo have lost a wonderful, strong, gentle and beautiful lady; who lived her life by her motto that guided her entire life "Be strong, Be gentle, Be beautiful”, essential words to live by not only in Judo but in life. She will be missed, all her students, personal friends and the rest of the Judo world, but especially by her constant companion and protector Dr. Shelley Fernandez, PHD.